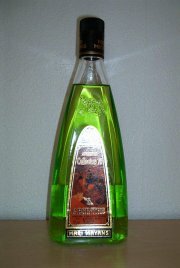 Absinthe.se - Mari Mayans 70 - Collectors ed. Absinthe Reviews Modern Absinthes Spain Mari Mayans 70 - Collectors ed. After a trip to London I finally got home and got the chance to start tasting the five new absinthes I had bought. This was one of them. The Mari Mayans was known to be among the tastier ones, at a time before the more authentic absinthes started popping up. Still, it's quite tasty to some extent. It's loaded with anise, it's very strong and the flourescent green color is really... green. Even though it's at such a high alcohol level, it doesn't smell or taste too much alcohol. That's due to the fact that the anise takes out everything else. I tried it both with and without sugar, and either one works just fine. Upon the addition of cold water it gives a very nice louche, obviously from the star anise. To sum it up, I'd say I actually enjoy it from time to time. As an aperitif a really hot summers night in a glass loaded with ice and water, it is quite allright. But it's nothing I'd sit sipping slowly, enjoying, with maybe a good cigar. It breathes Ibiza party.